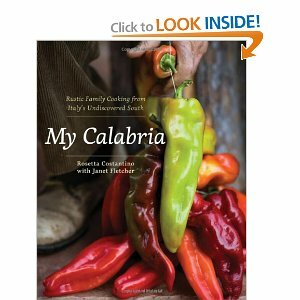 Part cookbook, part memoir, the author, Rosetta Costantino chronicles the traditional foods of southern Italy. Tropea, a small village perched on a cliff overlooking the Tyrrhenian Sea is famous for its sweet red onions. Rosetta gave a recipe for a red onion soup that I thought sounded delicious. And so it is. It's similar to French Onion Soup, but sweeter. Very mellow and rich. The famous red onions of Tropea are not available here, but Rosetta suggested using the red onions we do have. Unlike the French version of onion soup, this one has no crouton on top, just cheese, broiled until brown. I tinkered with the recipe a little, adding in some red wine and using chicken stock in place of water or vegetable stock. The recipe is simple, but give yourself enough time to make it. The onions need to cook slowly, not browning at all, for at least one hour, then an additional 30 minutes in the stock. Pour the oil into the bottom of a 6-8 quart pot. Stir in the onions and the salt. Cook over medium low heat, stirring occasionally, until the onions are very soft and sweet, not browned at all. This will take about 60 minutes. Add the wine and the stock. Bring the mixture to a boil, lower the heat, and simmer gently for about 30 minutes. Run an immersion blender through the soup, just enough to give it a slight creaminess, but not pureeing it entirely. Or, remove about 1/2 of the soup to a blender and puree it, then return it to the pot. Sprinkle with pepper, add more salt if needed. Divide the soup among 6 oven-proof bowls. Sprinkle cheese on top of each and run under the broiler for a minute or two until the cheese melts and browns. Watch carefully so as not to burn it. For a more hearty meal, place a slice of toasted crusty bread in the bottom of the bowl and ladle the soup over it. Mmmm...I somehow missed before that you have a cooking blog! This soup sounds exquisite - I am putting it in my line-up of soups to try this cold and dark season. Onion soup is not my favorite, but I love your photos! I could try it just for that! Oh baby, that's just what this Ozark Farm Chick needs to warm up a cold wintery afternoon and I have all the fixens. From the happy hills and hollers of the Missouri Ponderosa, ya'll have a blessed and beautiful week!!! Mmmm! This looks so tasty!